Whenever I venture into an Asian market, I try to pick up something I’ve never seen before or isn’t labeled in English. It’s always fun to try to figure out what mysterious bundle or piece of produce I’ve randomly selected and even more fun to figure out how to use it. Along the way, I’ve discovered lychees, rambutan, water caltrops (which I never actually ate), horned melons and countless other items over the years. My most recent discovery was made during our last month living in Boston, at the Super 88 in Malden—Thai eggplants. Beautiful, but bitter with the seeds intact and smelling faintly of bananas, this firm fruit kind of looks like a tiny watermelon and tastes similar to Italian or American eggplants. I wasn’t sure what to pair with it, but knew it needed a little sweetness to balance out the residual bitter taste after the seeds were removed, so I made a sauce with a hint of agave and mirin. 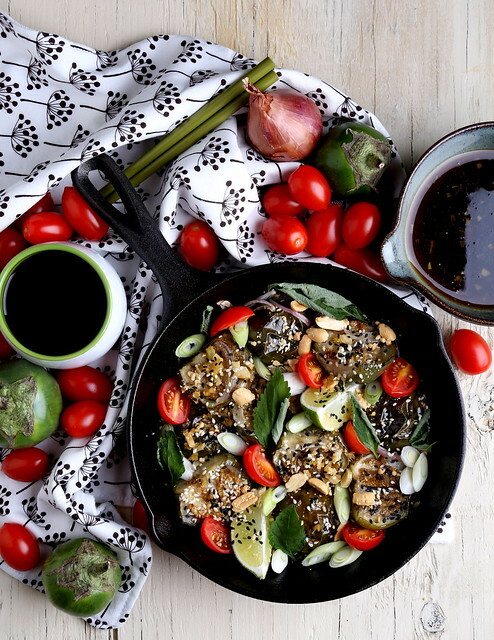 A handful of halved cherry tomatoes gave this dish a pop of color while basil and lime gave it a decidedly Thai look and feel. Before spooning this over rice or noodles, peanuts and scallions are sprinkled over the top to round everything else out with a little contrast and crunch. If you can’t find Thai eggplant, chunks of Italian or American eggplant will also work here. Place the oil into the bottom of a cast iron skillet, tilting to coat. Add the eggplant and cover with foil. Roast for 10 minutes, then remove them from the oven and flip over. Sprinkle the sliced shallots over the top, then cover with the foil and bake for an additional 10 minutes. Pour about half of the sauce over the top and roast, uncovered for about 10 minutes more. Place the eggplant into serving bowls over rice or noodles and garnish with fresh tomato, basil, lime wedges, peanuts, scallions, sesame seeds, rice or noodles and extra sauce on the side as desired. 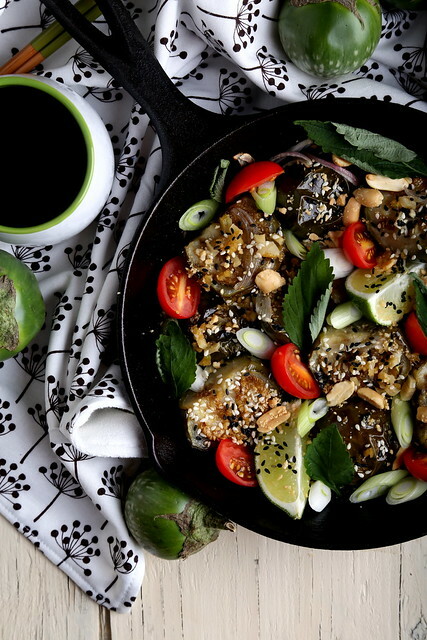 i adore thai eggplant, actually all eggplants, and you are so adventurous! i've always ever had it in stews or curries. 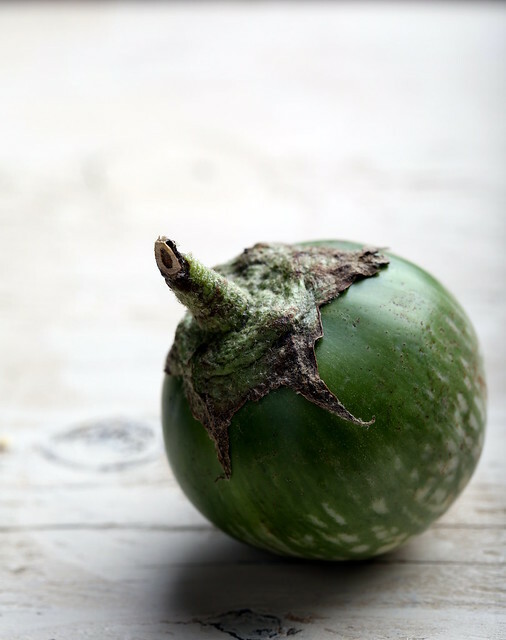 I love Thai eggplants – just had them in a curry few days ago! They are tender and easy to cook than other eggplants. I just made this recipe and put it on top of quinoa and it was fabulous. I love al the flavors. The leftovers were equally fantastic. Thank you for this recipe! Curatedvegan.com. Thank you for trying it out and your feedback — I'm so happy you enjoyed it!